When repairing PCB board, the public power short circuit fault is often very complicated, because many devices share the same power supply, thus each device use this power supply device will have a suspect. If there are not many components on the board, you can find the short circuit point testing components one by one. If there are many components, then use a power supply device with adjustable voltage and current, voltage ranges from 0-30V, current 0-3A, this power supply device is not expensive, only cost RMB300 yuan. Adjust the open circuit voltage to the voltage level of power supply device. First, adjust the current to the minimum, this voltage is added to the circuit's supply voltage point such as 74 series chip 5V and 0V end, increase the current slowly based on the short circuit. Touch the device, when you find a hot device, then remove it for further measurement. Of course, the operating voltage must not exceed the operating voltage of the device, and can not be reversed, otherwise it will burn out other good devices. 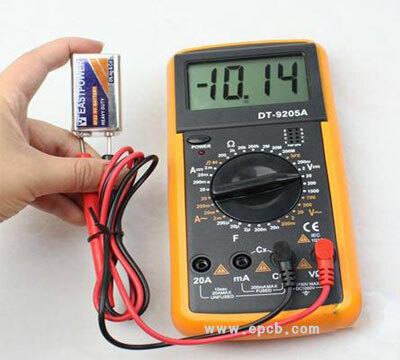 Some SMT components are very small, so it is difficult to test and repair them with ordinary multimeter pen because it is easy to cause short circuit. Here tell you a simple way which may bring you a lot of convenience. Take two smallest sewing needle, use thin copper wire from a multi-strand cable to tie the multimeter pen and needle closely and tightly, and then solder them together. A multimeter with a small tip will no longer have the risk of short circuit when testing those SMT component. And the tip can pierce the insulation coating, so you don’t have to scratch those films.